Athens (/ˈæθɪnz/; Greek: Αθήνα, Athína [aˈθina]; Ancient Greek: Ἀθῆναι, Athênai [a.tʰɛ̂ː.nai̯]) is the capital and largest city of Greece. Athens dominates the Attica region and is one of the world's oldest cities, with its recorded history spanning over 3,400 years and its earliest human presence starting somewhere between the 11th and 7th millennium BC. Athens is a global city and one of the biggest economic centres in southeastern Europe. It has a large financial sector, and its port Piraeus is both the largest passenger port in Europe, and the second largest in the world. while at the same time being the sixth busiest passenger port in Europe. The Municipality of Athens (also City of Athens) had a population of 664,046 (in 2011) within its administrative limits, and a land area of 38.96 km2 (15.04 sq mi). The urban area of Athens (Greater Athens and Greater Piraeus) extends beyond its administrative municipal city limits, with a population of 3,090,508 (in 2011) over an area of 412 km2 (159 sq mi). According to Eurostat in 2011, the functional urban area (FUA) of Athens was the 9th most populous FUA in the European Union (the 6th most populous capital city of the EU), with a population of 3.8 million people. Athens is also the southernmost capital on the European mainland. The oldest known human presence in Athens is the Cave of Schist, which has been dated to between the 11th and 7th millennia BC. Athens has been continuously inhabited for at least 7,000 years. By 1400 BC the settlement had become an important centre of the Mycenaean civilization and the Acropolis was the site of a major Mycenaean fortress, whose remains can be recognised from sections of the characteristic Cyclopean walls. Unlike other Mycenaean centers, such as Mycenae and Pylos, it is not known whether Athens suffered destruction in about 1200 BC, an event often attributed to a Dorian invasion, and the Athenians always maintained that they were pure Ionians with no Dorian element. However, Athens, like many other Bronze Age settlements, went into economic decline for around 150 years afterwards. Iron Age burials, in the Kerameikos and other locations, are often richly provided for and demonstrate that from 900 BC onwards Athens was one of the leading centres of trade and prosperity in the region. The leading position of Athens may well have resulted from its central location in the Greek world, its secure stronghold on the Acropolis and its access to the sea, which gave it a natural advantage over inland rivals such as Thebes and Sparta. By the 6th century BC, widespread social unrest led to the reforms of Solon. These would pave the way for the eventual introduction of democracy by Cleisthenes in 508 BC. 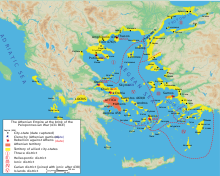 Athens had by this time become a significant naval power with a large fleet, and helped the rebellion of the Ionian cities against Persian rule. In the ensuing Greco-Persian Wars Athens, together with Sparta, led the coalition of Greek states that would eventually repel the Persians, defeating them decisively at Marathon in 490 BC, and crucially at Salamis in 480 BC. However, this did not prevent Athens from being captured and sacked twice by the Persians within one year, after a heroic but ultimately failed resistance at Thermopylae by Spartans and other Greeks led by King Leonidas, after both Boeotia and Attica fell to the Persians. The decades that followed became known as the Golden Age of Athenian democracy, during which time Athens became the leading city of Ancient Greece, with its cultural achievements laying the foundations for Western civilization. The playwrights Aeschylus, Sophocles and Euripides flourished in Athens during this time, as did the historians Herodotus and Thucydides, the physician Hippocrates, and the philosopher Socrates. Guided by Pericles, who promoted the arts and fostered democracy, Athens embarked on an ambitious building program that saw the construction of the Acropolis of Athens (including the Parthenon), as well as empire-building via the Delian League. Originally intended as an association of Greek city-states to continue the fight against the Persians, the league soon turned into a vehicle for Athens's own imperial ambitions. The resulting tensions brought about the Peloponnesian War (431–404 BC), in which Athens was defeated by its rival Sparta. By the mid-4th century BC, the northern Greek kingdom of Macedon was becoming dominant in Athenian affairs. In 338 BC the armies of Philip II defeated an alliance of some of the Greek city-states including Athens and Thebes at the Battle of Chaeronea, effectively ending Athenian independence. Later, under Rome, Athens was given the status of a free city because of its widely admired schools. The Roman emperor Hadrian, in the 2nd century CE, constructed a library, a gymnasium, an aqueduct which is still in use, several temples and sanctuaries, a bridge and financed the completion of the Temple of Olympian Zeus. By the end of Late Antiquity, the city experienced decline followed by recovery in the second half of the Middle Byzantine Period, in the 9th to 10th centuries CE, and was relatively prosperous during the Crusades, benefiting from Italian trade. After the Fourth Crusade the Duchy of Athens was established. In 1458 it was conquered by the Ottoman Empire and entered a long period of decline. The Stadiou Street in Central Athens in 1908. Following the Greek War of Independence and the establishment of the Greek Kingdom, Athens was chosen as the capital of the newly independent Greek state in 1834, largely because of historical and sentimental reasons. At the time, it was reduced to a town of about 4,000 people in a loose swarm of houses along the foot of the Acropolis. The first King of Greece, Otto of Bavaria, commissioned the architects Stamatios Kleanthis and Eduard Schaubert to design a modern city plan fit for the capital of a state. The first modern city plan consisted of a triangle defined by the Acropolis, the ancient cemetery of Kerameikos and the new palace of the Bavarian king (now housing the Greek Parliament), so as to highlight the continuity between modern and ancient Athens. Neoclassicism, the international style of this epoch, was the architectural style through which Bavarian, French and Greek architects such as Hansen, Klenze, Boulanger or Kaftantzoglou designed the first important public buildings of the new capital. In 1896, Athens hosted the first modern Olympic Games. During the 1920s a number of Greek refugees, expelled from Asia Minor after the Greco-Turkish War, swelled Athens's population; nevertheless it was most particularly following World War II, and from the 1950s and 1960s, that the population of the city exploded, and Athens experienced a gradual expansion. The Entry of King Otto in Athens, Peter von Hess, 1839. In the 1980s it became evident that smog from factories and an ever-increasing fleet of automobiles, as well as a lack of adequate free space due to congestion, had evolved into the city's most important challenge. A series of anti-pollution measures taken by the city's authorities in the 1990s, combined with a substantial improvement of the city's infrastructure (including the Attiki Odos motorway, the expansion of the Athens Metro, and the new Athens International Airport), considerably alleviated pollution and transformed Athens into a much more functional city. In 2004 Athens hosted the 2004 Summer Olympics. View of Mount Penteli, the second tallest mountain surrounding Athens. Athens sprawls across the central plain of Attica that is often referred to as the Athens or Attica Basin (Greek: Λεκανοπέδιο Αττικής). The basin is bounded by four large mountains: Mount Aigaleo to the west, Mount Parnitha to the north, Mount Pentelicus to the northeast and Mount Hymettus to the east. Beyond Mount Aegaleo lies the Thriasian plain, which forms an extension of the central plain to the west. The Saronic Gulf lies to the southwest. Mount Parnitha is the tallest of the four mountains (1,413 m (4,636 ft)), and has been declared a national park. Athens is built around a number of hills. Lycabettus is one of the tallest hills of the city proper and provides a view of the entire Attica Basin. 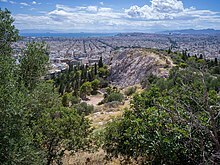 The meteorology of Athens is deemed to be one of the most complex in the world because its mountains cause a temperature inversion phenomenon which, along with the Greek Government's difficulties controlling industrial pollution, was responsible for the air pollution problems the city has faced. This issue is not unique to Athens; for instance, Los Angeles and Mexico City also suffer from similar atmospheric inversion problems. By the late 1970s, the pollution of Athens had become so destructive that according to the then Greek Minister of Culture, Constantine Trypanis, "...the carved details on the five the caryatids of the Erechtheum had seriously degenerated, while the face of the horseman on the Parthenon's west side was all but obliterated." A series of measures taken by the authorities of the city throughout the 1990s resulted in the improvement of air quality; the appearance of smog (or nefos as the Athenians used to call it) has become less common. Measures taken by the Greek authorities throughout the 1990s have improved the quality of air over the Attica Basin. Nevertheless, air pollution still remains an issue for Athens, particularly during the hottest summer days. In late June 2007, the Attica region experienced a number of brush fires, including a blaze that burned a significant portion of a large forested national park in Mount Parnitha, considered critical to maintaining a better air quality in Athens all year round. Damage to the park has led to worries over a stalling in the improvement of air quality in the city. The major waste management efforts undertaken in the last decade (particularly the plant built on the small island of Psytalia) have improved water quality in the Saronic Gulf, and the coastal waters of Athens are now accessible again to swimmers. In January 2007, Athens faced a waste management problem when its landfill near Ano Liosia, an Athenian suburb, reached capacity. The crisis eased by mid-January when authorities began taking the garbage to a temporary landfill. Athens has a hot-summer Mediterranean climate (Köppen climate classification: Csa). The dominant feature of Athens’ climate is alternation between prolonged hot and dry summers and mild winters with moderate rainfall. With an average of 417.2 millimetres (16.43 in) of yearly precipitation, rainfall occurs largely between the months of October and April. July and August are the driest months, when thunderstorms occur sparsely once or twice a month. The capital of Greece is sometimes considered the hottest city in Europe (considering the annual average temperature and not the records surpassed in the ranking by the south coast of Spain) and also the driest city. Owing to the rain shadow of the Pindus Mountains, annual precipitation of Athens is lower than most other parts of Greece, especially western Greece. As an example, Ioannina receives around 1,300 mm (51 in) per year, and Agrinio around 800 mm (31 in) per year. Daily average highs for July (1989–2018) have been measured at 34.4 °C or 93.9 °F, but some parts of the city may be even hotter, in particular western areas due to a combination of industrialization and a number of natural factors, knowledge of which has existed since the mid-19th century. Athens is affected by the urban heat island effect in some areas which is caused by human activity, altering its temperatures compared to the surrounding rural areas, and leaving detrimental effects on energy usage, expenditure for cooling, and health. The urban heat island of the city has also been found to be partially responsible for alterations of the climatological temperature time-series of specific Athens meteorological stations, because of its impact on the temperatures and the temperature trends recorded by some meteorological stations. On the other hand, specific meteorological stations, such as the National Garden station and Thiseio meteorological station, are less affected or do not experience the urban heat island. Changing of the Greek Presidential Guard in front of the Tomb of the Unknown Soldier at Syntagma Square. The municipality of Athens, the city centre of the Athens Urban Area, is divided into several districts: Omonoia, Syntagma, Exarcheia, Agios Nikolaos, Neapolis, Lykavittos, Lofos Strefi, Lofos Finopoulou, Lofos Filopappou, Pedion Areos, Metaxourgeio, Aghios Kostantinos, Larissa Station, Kerameikos, Psiri, Monastiraki, Gazi, Thission, Kapnikarea, Aghia Irini, Aerides, Anafiotika, Plaka, Acropolis, Pnyka, Makrygianni, Lofos Ardittou, Zappeion, Aghios Spyridon, Pangrati, Kolonaki, Dexameni, Evaggelismos, Gouva, Aghios Ioannis, Neos Kosmos, Koukaki, Kynosargous, Fix, Ano Petralona, Kato Petralona, Rouf, Votanikos, Profitis Daniil, Akadimia Platonos, Kolonos, Kolokynthou, Attikis Square, Lofos Skouze, Sepolia, Kypseli, Aghios Meletios, Nea Kypseli, Gyzi, Polygono, Ampelokipoi, Panormou-Gerokomeio, Pentagono, Ellinorosson, Nea Filothei, Ano Kypseli, Tourkovounia-Lofos Patatsou, Lofos Elikonos, Koliatsou, Thymarakia, Kato Patisia, Treis Gefyres, Aghios Eleftherios, Ano Patisia, Kypriadou, Menidi, Prompona, Aghios Panteleimonas, Pangrati, Goudi and Ilisia. Aiolou Street in the Centre. On the left is the building of the National Bank of Greece. Metaxourgeio (Greek: Μεταξουργείο) is a neighborhood of Athens. The neighborhood is located north of the historical centre of Athens, between Kolonos to the east and Kerameikos to the west, and north of Gazi. Metaxourgeio is frequently described as a transition neighborhood. After a long period of abandonment in the late 20th century, the area is acquiring a reputation as an artistic and fashionable neighborhood following the opening of art galleries, museums, restaurants and cafés. Local efforts to beautify and invigorate the neighborhood have reinforced a sense of community and artistic expression. Anonymous art pieces containing quotes and statements in both English and Ancient Greek have sprung up throughout the neighborhood, bearing statements such as "Art for art's sake" (Τέχνη τέχνης χάριν). Guerrilla gardening has also helped to beautify the area. Apartment buildings near Kolonaki Square. Syntagma, Syntagma Square, (Greek: Σύνταγμα/Constitution Square), is the capital's central and largest square, lying adjacent to the Greek Parliament (the former Royal Palace) and the city's most notable hotels. Ermou Street, an approximately one-kilometre-long (0.62-mile) pedestrian road connecting Syntagma Square to Monastiraki, is a consumer paradise for both Athenians and tourists. Complete with fashion shops and shopping centres promoting most international brands, it now finds itself in the top five most expensive shopping streets in Europe, and the tenth most expensive retail street in the world. Nearby, the renovated Army Fund building in Panepistimiou Street includes the "Attica" department store and several upmarket designer stores. Neoclassical Houses in the historical neighbourhood of Plaka. Plaka, Monastiraki, and Thission – Plaka (Greek: Πλάκα), lying just beneath the Acropolis, is famous for its plentiful neoclassical architecture, making up one of the most scenic districts of the city. It remains a prime tourist destination with tavernas, live performances and street salesmen. Nearby Monastiraki (Greek: Μοναστηράκι), for its part, is known for its string of small shops and markets, as well as its crowded flea market and tavernas specialising in souvlaki. Another district known for its student-crammed, stylish cafés is Theseum or Thission (Greek: Θησείο), lying just west of Monastiraki. Thission is home to the ancient Temple of Hephaestus, standing atop a small hill. This area also has a picturesque 11th-century Byzantine church, as well as a 15th-century Ottoman mosque. d in 1840 and is a green refuge of 15.5 hectares in the centre of the Greek capital. It is to be found between the Parliament and Zappeion buildings, the latter of which maintains its own garden of seven hectares. Parts of the city centre have been redeveloped under a masterplan called the Unification of Archeological Sites of Athens, which has also gathered funding from the EU to help enhance the project. The landmark Dionysiou Areopagitou Street has been pedestrianised, forming a scenic route. The route starts from the Temple of Olympian Zeus at Vasilissis Olgas Avenue, continues under the southern slopes of the Acropolis near Plaka, and finishes just beyond the Temple of Hephaestus in Thiseio. The route in its entirety provides visitors with views of the Parthenon and the Agora (the meeting point of ancient Athenians), away from the busy city centre. The hills of Athens also provide green space. Lycabettus, Philopappos hill and the area around it, including Pnyx and Ardettos hill, are planted with pines and other trees, with the character of a small forest rather than typical metropolitan parkland. Also to be found is the Pedion tou Areos (Field of Mars) of 27.7 hectares, near the National Archaeological Museum. Athens' largest zoo is the Attica Zoological Park, a 20-hectare (49-acre) private zoo located in the suburb of Spata. The zoo is home to around 2000 animals representing 400 species, and is open 365 days a year. Smaller zoos exist within public gardens or parks, such as the zoo within the National Garden of Athens. View of Vila Atlantis, in Kifissia, designed by Ernst Ziller. The Athens Metropolitan Area consists of 58 densely populated municipalities, sprawling around the municipality of Athens (the city centre) in virtually all directions. For the Athenians, all the urban municipalities surrounding the city centre are called suburbs. According to their geographic location in relation to the City of Athens, the suburbs are divided into four zones; the northern suburbs (including Agios Stefanos, Dionysos, Ekali, Nea Erythraia, Kifissia, Maroussi, Pefki, Lykovrysi, Metamorfosi, Nea Ionia, Nea Filadelfeia, Irakleio, Vrilissia, Melissia, Penteli, Chalandri, Agia Paraskevi, Galatsi, Psychiko and Filothei); the southern suburbs (including Alimos, Nea Smyrni, Moschato, Kallithea, Agios Dimitrios, Palaio Faliro, Elliniko, Glyfada, Argyroupoli, Ilioupoli, Voula and Vouliagmeni); the eastern suburbs (including Zografou, Dafni, Vyronas, Kaisariani, Cholargos and Papagou); and the western suburbs (including Peristeri, Ilion, Egaleo, Koridallos, Agia Varvara, Chaidari, Petroupoli, Agioi Anargyroi and Kamatero). Many of the southern suburbs (such as Alimos, Palaio Faliro, Elliniko, Glyfada, Voula, Vouliagmeni and Varkiza) known as the Athens Riviera, host a number of sandy beaches, most of which are operated by the Greek National Tourism Organisation and require an entrance fee. Casinos operate on both Mount Parnitha, some 25 km (16 mi) from downtown Athens (accessible by car or cable car), and the nearby town of Loutraki (accessible by car via the Athens – Corinth National Highway, or the suburban rail service Proastiakos). The mayor of Athens Giorgos Kaminis (right) with the ex Prime Minister of Greece, George Papandreou Jr.(left). The large City Centre of the Greek capital falls directly within the municipality of Athens, which is the largest in population size in Greece. Piraeus also forms a significant city centre on its own, within the Athens Urban Area and being the second largest in population size within it, with Peristeri and Kallithea following. View of the Athens urban area and the Saronic Gulf. The Athens Urban Area today consists of 40 municipalities, 35 of which make up what is referred to as the Greater Athens municipalities, located within 4 regional units (North Athens, West Athens, Central Athens, South Athens); and a further 5, which make up the Greater Piraeus municipalities, located within the regional unit of Piraeus as mentioned above. The densely built up urban area of the Greek capital sprawls across 412 km2 (159 sq mi) throughout the Attica Basin and has a total population of 3,074,160 (in 2011). The Athens municipality forms the core and center of Greater Athens, which consists of the Athens municipality and 34 more municipalities, divided in four regional units (Central, North, South and West Athens), accounting for 2,641,511 people (in 2011) within an area of 361 km2 (139 sq mi). Until 2010, these four regional units made up the abolished Athens Prefecture. The municipality of Piraeus, the historic Athenian port, with its 4 suburban municipalities make up the regional unit of Piraeus, which in turn forms Greater Piraeus. Greater Athens and Greater Piraeus combined make up the continuous built up Athens Urban Area (Greek: Πολεοδομικό Συγκρότημα Αθηνών), also called the Urban Area of the Capital (Greek: Πολεοδομικό Συγκρότημα Πρωτεύουσας) or simply Athens (the most common use of the term), spanning over 412 km2 (159 sq mi), with a population of 3,090,508 people as of 2011. The Athens Urban Area is considered to form the city of Athens as a whole, despite its administrative divisions, which is the largest in Greece and one of the most populated urban areas in Europe. View of Athens and the Saronic Gulf from the Philopappou Hill. 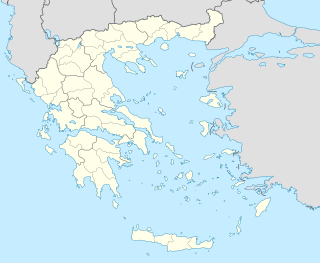 The Athens Metropolitan Area spans 2,928.717 km2 (1,131 sq mi) within the Attica region and includes a total of 58 municipalities, which are organized in 7 regional units (those outlined above, along with East Attica and West Attica), having reached a population of 3,737,550 based on the preliminary results of the 2011 census. Athens and Piraeus municipalities serve as the two metropolitan centres of the Athens Metropolitan Area. There are also some inter-municipal centres serving specific areas. For example, Kifissia and Glyfada serve as inter-municipal centres for northern and southern suburbs respectively. The municipality (City) of Athens is the most populous in Greece, with a population of 664,046 people (in 2011) and an area of 38.96 km2 (15.04 sq mi), forming the core of the Athens Urban Area within the Attica Basin. The current mayor of Athens is Giorgos Kaminis. The municipality is divided into seven municipal districts which are mainly used for administrative purposes. For the Athenians the most popular way of dividing the city proper is through its neighbourhoods such as Pagkrati, Ambelokipi, Exarcheia, Patissia, Ilissia, Petralona, Koukaki and Kypseli, each with its own distinct history and characteristics. The Athens Metropolitan Area, with an area of 2,928.717 km2 (1,131 sq mi) and inhabited by 3,753,783 people in 2011, consists of the Athens Urban Area with the addition of the towns and villages of East and West Attica, which surround the dense urban area of the Greek capital. It actually sprawls over the whole peninsula of Attica, which is the best part of the region of Attica, excluding the islands. Mycenean Athens in 1600–1100 BC could have reached the size of Tiryns; that would put the population at the range of 10,000 – 15,000. During the Greek Dark Ages the population of Athens was around 4,000 people. In 700 BC the population grew to 10,000. In 500 BC the area probably contained 200,000 people. During the classical period the city's population is estimated from 150,000–350,000 and up to 610,000 according to Thucydides. When Demetrius of Phalerum conducted a population census in 317 BC the population was 21,000 free citizens, plus 10,000 resident aliens and 400,000 slaves. This suggests a total population of 431,000. This figure is highly suspect because of the lopsided number of slaves and does not include free women and children and resident foreigners: an estimated based on Thucydides is: 40,000 male citizens, 100,000 family members, 70,000 metics (resident foreigners) and 150,000-400,000 slaves. However the numbers would include Attica and not just Athens the city. The ancient site of Athens is centred on the rocky hill of the acropolis. In ancient times the port of Piraeus was a separate city, but it has now been absorbed into the Athens Urban Area. The rapid expansion of the city, which continues to this day, was initiated in the 1950s and 1960s, because of Greece's transition from an agricultural to an industrial nation. The expansion is now particularly toward the East and North East (a tendency greatly related to the new Eleftherios Venizelos International Airport and the Attiki Odos, the freeway that cuts across Attica). By this process Athens has engulfed many former suburbs and villages in Attica, and continues to do so. The table below shows the historical population of Athens in recent times. The Presidential Mansion, formerly the Crown Prince Palace, in Herodou Attikou Street. The Maximos Mansion, official office of the Prime Minister of the Hellenic Republic, in Herodou Attikou Street. The Athens City Hall in Kotzia Square was designed by Panagiotis Kolkas and completed in 1874. The Embassy of France in Queen Sophia's Avenue. Athens became the capital of Greece in 1834, following Nafplion, which was the provisional capital from 1829. The municipality (City) of Athens is also the capital of the Attica region. The term Athens can refer either to the municipality of Athens, to Greater Athens, or to the entire Athens Urban Area. Ermou street, the main commercial street of Athens, near the Syntagma Square. Athens is one of the major economic centres in south-eastern Europe and is considered as a regional economic power in Europe generally. The proximity to the port of Piraeus, where big investments by COSCO have already been delivered during the recent decade, the completion of the new Cargo Centre in Thriasion , the expansion of the Athens Metro and the Athens Tram, as well as the projected metropolitan park in Elliniko and other economic projects are the economic landmarks of the upcoming years. Important Greek companies are Mytilineos Holdings, Titan Cement, Folli Follie, Jumbo S.A., OPAP and COSMOTE have their headquarters in the metropolitan area of Athens, while multinational companies such as Ericsson, Siemens, Motorola, Samsung, Novartis and Coca-Cola have their regional research and development headquarters also there. The 28-storey Athens Tower, which houses offices, was completed in 1971 and is the tallest building in Greece. Athens is serviced by a variety of transportation means, forming the largest mass transit system of Greece. The Athens Mass Transit System consists of a large bus fleet, a trolleybus fleet that mainly serves Athens's city center, the city's Metro, a commuter rail service and a tram network, connecting the southern suburbs to the city centre. OSY (Greek: ΟΣΥ) (ODIKES SYGKOINONIES) which is subsidiary company of OASA (Athens transport urban organisation), is the main operator of buses and trolleybusses in Athens. Its network consists of about 300 bus lines and 22 trolleybus lines which span the Athens Metropolitan Area, with a fleet of 1,839 buses and 366 trolleybuses. Of those 1,839 buses 416 run on compressed natural gas, making up the largest fleet of natural gas-powered buses in Europe and all trolleybusses are equipped to enable them to run on diesel in case of power failure. International and regional bus links are provided by KTEL from two InterCity Bus Terminals, Kifissos Bus Terminal A and Liosion Bus Terminal B, both located in the north-western part of the city. Kifissos provides connections towards the Peloponnese and Attica, whereas Liosion is used for most northerly mainland destinations. The Athens Metro is operating by STASY S.A (STATHERES SYGKOINONIES S.A) which is a subsidiary company of OASA (Athens urban transport organisation) and provides public transport throughout the Athens Urban Area. While its main purpose is transport, it also houses Greek artifacts found during construction of the system. The Athens Metro has an operating staff of 387 and runs three metro lines; namely the Green (line 1), Red (line 2) and Blue (line 3) lines, which the first were constructed in 1869, and the other two largely during the 1990s, with the initial sections opened in January 2000. The line 1 for the most part runs at ground level and the other two (line 2,3) routes run entirely underground and a fleet of 42 trains consisting of 252 cars operate within the network, with a daily occupancy of 1,353,000 passengers. The Green Line (line 1) serves 24 stations, and forms the oldest line of the Athens metro network. Runs from Piraeus station to Kifissia station and covers a distance of 25.6-kilometre (15.9 mi). There are also transfer connections with the Blue (line 3) at the Monastiraki station and with Red (line 2) at Onomoia and Attiki stations. The Red Line (line 2) runs from Anthoupoli station to Elliniko station and covers a distance of 17.5 km (10.9 mi). The line connects the western suburbs of Athens with the southeast suburbs, passing through the center of Athens. The Red line has transfer connections with the Green (line 1) at Attiki and Omonoia Square stations. There are also transfer connections with the Blue (line 3) at the Syntagma Square station and with the Tram at Syntagma Square, Sygrou-Fix and Agios Ioannis stations. The Blue Line (line 3) runs from the western suburbs, namely Agia Marina to the Egaleo station, through the central Monastiraki and Syntagma stations to Doukissis Plakentias avenue in the northeastern suburb of Halandri, covering a distance of 16 km (10 mi), then ascending to ground level and reaching Eleftherios Venizelos International Airport, using the Suburban Railway infrastructure and extending its length to 39 km (24 mi). The spring 2007 extension from Monastiraki westwards, to Egaleo, connected some of the main night life hubs of the city, namely the ones of Gazi (Kerameikos station) with Psirri (Monastiraki station) and the city centre (Syntagma station). Extensions are under construction to the west southwest suburbs of Athens, reaching the port of Piraeus. The new stations will be Agia Barvara, Koridallos, Nikaia, Maniatika, Piraeus and Dimotiko Theatro station. The stations will be ready in 2021 (the first three will open in June 2019), connecting the biggest port of Greece, Piraeus Port ,with the biggest airport of Greece the Athens International Airport. The Athens Metropolitan Railway system is managed by STASY which is a subsidiary company of OASA (Athens urban transport organisation). The Athens commuter rail service, referred to as the "Proastiakós", connects Eleftherios Venizelos International Airport to the city of Kiato, 106 km (66 mi) west of Athens, via Larissa station, the city's central rail station and the port of Piraeus. The service is sometimes considered the fourth line of the Athens Metro. 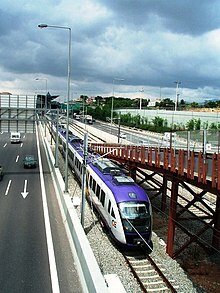 The length of Athens's commuter rail network extends to 120 km (75 mi), and is expected to stretch to 281 km (175 mi) by 2010. The Proastiakos will be extended to Xylokastro west of Athens and Chalkida. Vehicle of the Athens Tram. Athens Tram SA operates a fleet of 35 Sirio type vehicles which serve 48 stations, employ 345 people with an average daily occupancy of 65,000 passengers. The tram network spans a total length of 27 km (17 mi) and covers ten Athenian suburbs. The network runs from Syntagma Square to the southwestern suburb of Palaio Faliro, where the line splits in two branches; the first runs along the Athens coastline toward the southern suburb of Voula, while the other heads toward the Piraeus district of Neo Faliro. The network covers the majority of the Saronic coastline. Further extensions are planned towards the major commercial port of Piraeus. The expansion to Piraeus will include 12 new stations, increase the overall length of tram route by 5.4 km (3 mi), and increase the overall transportation network. Athens is served by the Athens International Airport (ATH), located near the town of Spata, in the eastern Messoghia plain, some 35 km (22 mi) east of Athens. The airport, awarded the "European Airport of the Year 2004" Award, is intended as an expandable hub for air travel in southeastern Europe and was constructed in 51 months, costing 2.2 billion euros. It employs a staff of 14,000. 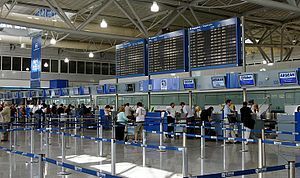 The airport is served by the Metro, the suburban rail, buses to Piraeus port, Athens' city centre and its suburbs, and also taxis. The airport accommodates 65 landings and take-offs per hour, with its 24-passenger boarding bridges, 144 check-in counters and broader 150,000 m2 (1,614,587 sq ft) main terminal; and a commercial area of 7,000 m2 (75,347 sq ft) which includes cafés, duty-free shops, and a small museum. In 2018,the airport handled 24,135,736 a huge increase over the last 4 years,In 2014, the airport handled 15,196,369 passengers, an increase of 21.2% over the previous year of 2013. Of those 15,196,369 passengers, 5,267,593 passed through the airport for domestic flights, and 9,970,006 passengers travelled through for international flights. Beyond the dimensions of its passenger capacity, ATH handled 205,294 total flights in 2007, or approximately 562 flights per day. Athens is the hub of the country's national railway system (OSE), connecting the capital with major cities across Greece and abroad (Istanbul, Sofia and Bucharest).The Port of Piraeus connects Athens to the numerous Greek islands of the Aegean Sea, with ferries departing, while also serving the cruise ships that arrive. Two main motorways of Greece begin in Athens, namely the A1/E75, which crosses through Athens's Urban Area from Piraeus, heading north towards Greece's second largest city, Thessaloniki; and the A8/E94 heading west, towards Patras, which incorporated the GR-8A. Before their completion much of the road traffic used the GR-1 and the GR-8. Athens' Metropolitan Area is served by the motorway network of the Attiki Odos toll-motorway (code: A6). Its main section extends from the western industrial suburb of Elefsina to Athens International Airport; while two beltways, namely the Aigaleo Beltway (A65) and the Hymettus Beltway (A64) serve parts of western and eastern Athens respectively. The span of the Attiki Odos in all its length is 65 km (40 mi), making it the largest metropolitan motorway network in all of Greece. Located on Panepistimiou Street, the old campus of the University of Athens, the National Library, and the Athens Academy form the "Athens Trilogy" built in the mid-19th century. Most of the university's workings have been moved to a much larger, modern campus located in the eastern suburb of Zografou. The second higher education institution in the city is the Athens Polytechnic School, found in Patission Street. This was the location where on 17 November 1973, more than 13 students were killed and hundreds injured inside the university during the Athens Polytechnic uprising, against the military junta that ruled the nation from 21 April 1967 until 23 July 1974. 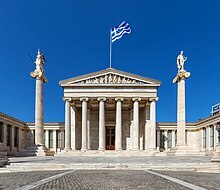 Other universities that lie within Athens are the Athens University of Economics and Business, the Panteion University, the Agricultural University of Athens and the University of Piraeus. There are overall eleven state-supported Institutions of Higher (or Tertiary) education located in the Metropolitan Area of Athens, these are by chronological order: Athens School of Fine Arts (1837), National Technical University of Athens (1837), National and Kapodistrian University of Athens (1837), Agricultural University of Athens (1920), Athens University of Economics and Business (1920), Panteion University of Social and Political Sciences (1927), University of Piraeus (1938), Technological Educational Institute of Piraeus (1976), Technological Educational Institute of Athens (1983), Harokopio University (1990), School of Pedagogical and Technological Education (2002). There are also several other private colleges, as they called formally in Greece, as the establishment of private universities is prohibited by the constitution. Many of them are accredited by a foreign state or university such as the American College of Greece and the Athens Campus of the University of Indianapolis. From the Temple of Olympian Zeus to the Lycabettus hill, as seen from the roof terrace of the "Royal Olympic" hotel, Athens, Greece. The Temple of Hephaestus in the Ancient Agora in central Athens. The city is a world centre of archaeological research. Along with national institutions, such as the Athens University and the Archaeological Society, there are multiple archaeological Museums including the National Archaeological Museum, the Cycladic Museum, the Epigraphic Museum, the Byzantine & Christian Museum, as well as museums at the ancient Agora, Acropolis, Kerameikos, and the Kerameikos Archaeological Museum. The city is also home to the Demokritos laboratory for Archaeometry, alongside regional and national archaeological authorities that form part of the Greek Department of Culture. Interior of the Academy of Athens, designed by Theophil Hansen. Athens hosts 17 Foreign Archaeological Institutes which promote and facilitate research by scholars from their home countries. As a result, Athens has more than a dozen archaeological libraries and three specialized archaeological laboratories, and is the venue of several hundred specialized lectures, conferences and seminars, as well as dozens of archaeological exhibitions, each year. At any given time, hundreds of international scholars and researchers in all disciplines of archaeology are to be found in the city. Two apartment buildings in central Athens. The left one is a modernist building of the 1930s, while the right one was built in the 1950s. Athens incorporates architectural styles ranging from Greco-Roman and Neoclassical to modern times. They are often to be found in the same areas, as Athens is not marked by a uniformity of architectural style. A visitor will quickly notice the absence of tall buildings: Athens has very strict height restriction laws in order to ensure the Acropolis hill is visible throughout the city. For the greatest part of the 19th century Neoclassicism dominated Athens, as well as some deviations from it such as Eclecticism, especially in the early 20th century. Thus, the Old Royal Palace was the first important public building to be built, between 1836 and 1843. Later in the mid and late 19th century, Theophil Freiherr von Hansen and Ernst Ziller took part in the construction of many neoclassical buildings such as the Athens Academy and the Zappeion Hall. Ziller also designed many private mansions in the centre of Athens which gradually became public, usually through donations, such as Schliemann's Iliou Melathron. Beginning in the 1920s, Modern architecture including Bauhaus and Art Deco began to exert an influence on almost all Greek architects, and buildings both public and private were constructed in accordance with these styles. Localities with a great number of such buildings include Kolonaki, and some areas of the centre of the city; neighbourhoods developed in this period include Kypseli. In the 1950s and 1960s during the extension and development of Athens, other modern movements such as the International style played an important role. The centre of Athens was largely rebuilt, leading to the demolition of a number of neoclassical buildings. The architects of this era employed materials such as glass, marble and aluminium, and many blended modern and classical elements. After World War II, internationally known architects to have designed and built in the city included Walter Gropius, with his design for the US Embassy, and, among others, Eero Saarinen, in his postwar design for the east terminal of the Ellinikon Airport. The Old Parliament House, now home to the National History Museum. View from Stadiou Street. All over the city can be found several statues or busts. Apart from the neoclassicals by Leonidas Drosis at the Academy of Athens (Plato, Socrates, Apollo, Athena), other notable include the statue of Theseus by Georgios Fytalis at Thiseion, of philhellenes like Lord Byron, George Canning and William Gladstone, the equestrian statue of Theodoros Kolokotronis by Lazaros Sochos in front of the Old Parliament, statues of Ioannis Kapodistrias, Rigas Feraios and Adamantios Korais at the University, of Evangelos Zappas and Konstantinos Zappas at Zappeion, of Ioannis Varvakis at the National Garden, the "woodbreaker" by Dimitrios Filippotis, the equestrian statue of Alexandros Papagos at Papagou district and various busts of fighters of Greek independence at the Pedion tou Areos. An important landmark is also the Tomb of the Unknown Soldier in Syntagma. the New Acropolis Museum, opened in 2009, and replacing the old museum on the Acropolis. The new museum has proved considerably popular; almost one million people visited during the summer period June–October 2009 alone. A number of smaller and privately owned museums focused on Greek culture and arts are also to be found. the Kerameikos Archaeological Museum, a museum which displays artifacts from the burial site of Kerameikos. Much of the pottery and other artifacts relate to Athenian attitudes towards death and the afterlife, throughout many ages. the Jewish Museum of Greece, a museum which describes the history and culture of the Greek Jewish community. Athens was voted as the third best European city to visit in 2015 by European Best Destination. More than 240,000 people voted. Athens is home to 148 theatrical stages, more than any other city in the world, including the ancient Odeon of Herodes Atticus, home to the Athens Festival, which runs from May to October each year. In addition to a large number of multiplexes, Athens plays host to open air garden cinemas. The city also supports music venues, including the Athens Concert Hall (Megaron Moussikis), which attracts world class artists. The Athens Planetarium, located in Andrea Syngrou Avenue, is one of the largest and best equipped digital planetaria in the world. The Stavros Niarchos Foundation Cultural Center, inaugurated in 2016, will house the National Library of Greece and the Greek National Opera. The Stavros Niarchos Foundation Cultural Centre, home of the Greek National Opera and the new National Library, at night during Christmas. The National Theatre in central Athens. The most successful songs during the period 1870–1930 were the so-called Athenian serenades (Αθηναϊκές καντάδες), based on the Heptanesean kantádhes (καντάδες 'serenades'; sing. : καντάδα) and the songs performed on stage (επιθεωρησιακά τραγούδια 'theatrical revue songs') in revues, musical comedies, operettas and nocturnes that were dominating Athens' theatre scene. Notable composers of operettas or nocturnes were Kostas Giannidis, Dionysios Lavrangas, Nikos Hatziapostolou, while Theophrastos Sakellaridis' The Godson remains probably the most popular operetta. Despite the fact that the Athenian songs were not autonomous artistic creations (in contrast with the serenades) and despite their original connection with mainly dramatic forms of Art, they eventually became hits as independent songs. Notable actors of Greek operettas, who made also a series of melodies and songs popular at that time, include Orestis Makris, Kalouta sisters, Vasilis Avlonitis, Afroditi Laoutari, Eleni Papadaki, Marika Nezer, Marika Krevata and others. After 1930, wavering among American and European musical influences as well as the Greek musical tradition. Greek composers begin to write music using the tunes of the tango, waltz, swing, foxtrot, some times combined with melodies in the style of Athenian serenades' repertory. Nikos Gounaris was probably the most renowned composer and singer of the time. In 1923, after the population exchange between Greece and Turkey, many ethnic Greeks from Asia Minor fled to Athens as a result of the Greco-Turkish War. They settled in poor neighborhoods and brought with them Rebetiko music, making it popular also in Greece, which became later the base for the Laïko music. Other forms of song popular today in Greece are elafrolaika, entechno, dimotika, and skyladika. Greece's most notable, and internationally famous, composers of Greek song, mainly of the entechno form, are Manos Hadjidakis and Mikis Theodorakis. Both composers have achieved fame abroad for their composition of film scores. Athens has a long tradition in sports and sporting events, serving as home to the most important clubs in Greek sport and housing a large number of sports facilities. The city has also been host to sports events of international importance. Athens has hosted the Summer Olympic Games twice, in 1896 and 2004. The 2004 Summer Olympics required the development of the Athens Olympic Stadium, which has since gained a reputation as one of the most beautiful stadiums in the world, and one of its most interesting modern monuments. The biggest stadium in the country, it hosted two finals of the UEFA Champions League, in 1994 and 2007. Athens' other major stadium, located in the Piraeus area, is the Karaiskakis Stadium, a sports and entertainment complex, host of the 1971 UEFA Cup Winners' Cup Final. Athens has hosted the EuroLeague final three times, the first in 1985 and second in 1993, both at the Peace and Friendship Stadium, most known as SEF, a large indoor arena, and the third time in 2007 at the Olympic Indoor Hall. Events in other sports such as athletics, volleyball, water polo etc., have been hosted in the capital's venues. Athens is home to three European multi-sport clubs: Olympiacos, Panathinaikos, AEK Athens. In football, Olympiacos have dominated the domestic competitions, Panathinaikos made it to the 1971 European Cup Final, while AEK Athens is the other member of the big three. These clubs also have basketball teams; Panathinaikos and Olympiacos are among the top powers in European basketball, having won the Euroleague six times and three respectively, whilst AEK Athens was the first Greek team to win a European trophy in any team sport. Other notable clubs within Athens are Athinaikos, Panionios, Atromitos, Apollon, Panellinios, Ethnikos Piraeus, Maroussi BCE and Peristeri B.C.. Athenian clubs have also had domestic and international success in other sports. The Athens area encompasses a variety of terrain, notably hills and mountains rising around the city, and the capital is the only major city in Europe to be bisected by a mountain range. Four mountain ranges extend into city boundaries and thousands of miles of trails criss-cross the city and neighbouring areas, providing exercise and wilderness access on foot and bike. Beyond Athens and across the prefecture of Attica, outdoor activities include skiing, rock climbing, hang gliding and windsurfing. Numerous outdoor clubs serve these sports, including the Athens Chapter of the Sierra Club, which leads over 4,000 outings annually in the area. Beside the above clubs, inside the boundaries of Athens municipality there are some more clubs with presence in national divisions or notable action for short periods. Some of them are PAO Rouf (Rouf) with earlier presence in Gamma Ethniki, Petralona F.C. (el) (Petralona), football club founded in 1963, with earlier presence in Beta Ethniki, Attikos F.C. (el) (Kolonos), football club founded in 1919 with short presence in Gamma Ethniki, Athinais Kypselis(el) (Kypseli), football club founded in 1938 with short presence in Gamma Ethniki, Gyziakos (Gyzi), basketball club founded in 1937 with short presence in Beta Ethniki basketball and Aetos B.C. (el) (Agios Panteleimonas), basketball club founded in 1992 with earlier presence in A2 Ethniki Basketball. Another important Athenian sport club is the Athens Tennis Club founded in 1895 with important offer for the Greek tennis. Fencing before the king of Greece at the 1896 Summer Olympics. The Panathenaic Stadium of Athens (Kallimarmaron) dates back to the 4th century BC and has hosted the first modern Olympic Games in 1896. 1896 brought forth the revival of the modern Olympic Games, by Frenchman Pierre de Coubertin. Thanks to his efforts, Athens was awarded the first modern Olympic Games. In 1896, the city had a population of 123,000 and the event helped boost the city's international profile. 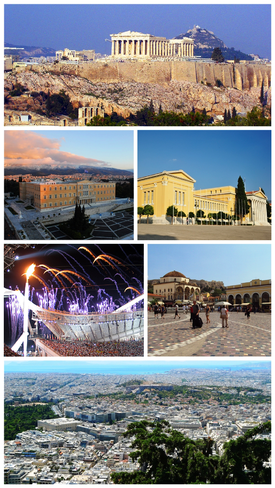 Of the venues used for these Olympics, the Kallimarmaro Stadium, and Zappeion were most crucial. The Kallimarmaro is a replica of the ancient Athenian stadiums, and the only major stadium (in its capacity of 60,000) to be made entirely of white marble from Mount Penteli, the same material used for construction of the Parthenon. The 1906 Summer Olympics, or the 1906 Intercalated games, were held in Athens. The intercalated competitions were intermediate games to the internationally organized Olympics, and were meant to be organized in Greece every four years, between the main Olympics. This idea later lost support from the IOC and these games were discontinued. Athens was awarded the 2004 Summer Olympics on 5 September 1997 in Lausanne, Switzerland, after having lost a previous bid to host the 1996 Summer Olympics, to Atlanta, United States. It was to be the second time Athens would host the games, following the inaugural event of 1896. After an unsuccessful bid in 1990, the 1997 bid was radically improved, including an appeal to Greece's Olympic history. In the last round of voting, Athens defeated Rome with 66 votes to 41. Prior to this round, the cities of Buenos Aires, Stockholm and Cape Town had been eliminated from competition, having received fewer votes. During the first three years of preparations, the International Olympic Committee had expressed concern over the speed of construction progress for some of the new Olympic venues. In 2000 the Organising Committee's president was replaced by Gianna Angelopoulos-Daskalaki, who was the president of the original Bidding Committee in 1997. From that point forward, preparations continued at a highly accelerated, almost frenzied pace. Although the heavy cost was criticized, estimated at $1.5 billion, Athens was transformed into a more functional city that enjoys modern technology both in transportation and in modern urban development. Some of the finest sporting venues in the world were created in the city, all of which were fully ready for the games. The games welcomed over 10,000 athletes from all 202 countries. The 2004 Games were judged a success, as both security and organization worked well, and only a few visitors reported minor problems mainly concerning accommodation issues. The 2004 Olympic Games were described as Unforgettable, dream Games, by IOC President Jacques Rogge for their return to the birthplace of the Olympics, and for meeting the challenges of holding the Olympic Games. The only observable problem was a somewhat sparse attendance of some early events. Eventually, however, a total of more than 3.5 million tickets were sold, which was higher than any other Olympics with the exception of Sydney (more than 5 million tickets were sold there in 2000). In 2008 it was reported that most of the Olympic venues had fallen into disrepair: according to those reports, 21 of the 22 facilities built for the games had either been left abandoned or are in a state of dereliction, with several squatter camps having sprung up around certain facilities, and a number of venues afflicted by vandalism, graffiti or strewn with rubbish. These claims, however, are disputed and likely to be inaccurate, as most of the facilities used for the Athens Olympics are either in use or in the process of being converted for post-Olympics use. The Greek Government has created a corporation, Olympic Properties SA, which is overseeing the post-Olympics management, development and conversion of these facilities, some of which will be sold off (or have already been sold off) to the private sector, while other facilities are still in use just as during the Olympics, or have been converted for commercial use or modified for other sports. Concerts and theatrical shows, such as those by the troupe Cirque du Soleil, have recently been held in the complex. 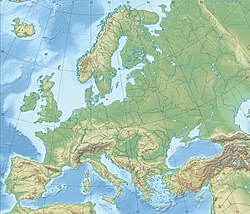 ^ "Eurostat – Data Explorer". appsso.eurostat.ec.europa.eu. ^ a b c d e f "Απογραφή Πληθυσμού – Κατοικιών 2011. ΜΟΝΙΜΟΣ Πληθυσμός" (in Greek). Hellenic Statistical Authority. ^ Wells, John C. (1990). "Athens". Longman pronunciation dictionary. Harlow, England: Longman. p. 48. ISBN 0-582-05383-8. ^ "Ancient Tablet Found: Oldest Readable Writing in Europe". 1 April 2011. Retrieved 18 September 2017. ^ a b "v4.ethnos.gr – Οι πρώτοι… Αθηναίοι". Ethnos.gr. July 2011. Archived from the original on 21 July 2011. Retrieved 26 October 2018. ^ "Contents and Principles of the Programme of Unification of the Archaeological Sites of Athens". Hellenic Ministry of Culture. www.yppo.gr. Retrieved 31 December 2009. ^ CNN & Associated Press (16 January 1997). "Greece uncovers 'holy grail' of Greek archeology". CNN. Archived from the original on 6 December 2007. Retrieved 28 March 2007. ^ "City Mayors: World's richest cities by purchasing power". City Mayors. 2008. Archived from the original on 6 May 2008. Retrieved 12 May 2008. ^ "City Mayors: Cost of living – The world's most expensive cities". City Mayors. 2008. Archived from the original on 24 December 2008. Retrieved 26 December 2008. ^ "Port of the month: Piraeus Port Authority". European Sea Ports Organisation V.Z.W./A.S.B.L. (ESPO). 30 April 2014. The Port of Piraeus is a port of large sizes. It is the largest passenger port and one of the largest commercial ports in Europe. ^ SPIEGEL ONLINE, Hamburg, Germany (9 April 2015). "China Seeks Gateway to Europe with Greek Port". SPIEGEL ONLINE. ^ "Piraeus by Maritime Database". www.maritime-database.com. Retrieved 27 December 2008. ^ "ANEK Lines – Piraeus". www.anek.gr. Archived from the original on 3 December 2008. Retrieved 27 December 2008. ^ a b c d "Characteristics". Hellenic Interior Ministry. www.ypes.gr. Archived from the original on 4 January 2007. Retrieved 6 January 2007. ^ a b c d "ΕΛΣΤΑΤ Απογραφη 2011" (PDF). www.statistics.gr. Archived from the original (PDF) on 11 October 2011. Retrieved 22 August 2011. ^ a b c d CNN & Sports Illustrated (5 September 1997). "Sentiment a factor as Athens gets 2004 Olympics". sportsillustrated.cnn.com. Archived from the original on 19 May 2008. Retrieved 28 March 2007. ^ As for example in Od.7.80. ^ a b Garland, Robert (2008). Ancient Greece: Everyday Life in the Birthplace of Western Civilization. New York: Sterling. ISBN 978-1-4549-0908-8. ^ Great Greek Encyclopedia, vol. II, Athens 1927, p. 30. ^ Bourne, Edward G. (1887). "The Derivation of Stamboul". American Journal of Philology. The Johns Hopkins University Press. 8 (1): 78–82. doi:10.2307/287478. JSTOR 287478. ^ a b c d Tung, Anthony (2001). "The City the Gods Besieged". Preserving the World's Great Cities: The Destruction and Renewal of the Historic Metropolis. New York: Three Rivers Press. p. 266. ISBN 0-609-80815-X. ^ Osborne, R. 1996, 2009. Greece in the Making 1200–479 BC. ^ "Nothing Less than Victory: Decisive Wars and the Lessons of History". Retrieved 24 December 2014. ^ "Focus on Athens" (PDF). UHI Quarterly Newsletter, Issue 1, May 2009, page 2. www.urbanheatisland.info. Archived from the original (PDF) on 22 July 2013. Retrieved 18 March 2011. ^ "Welcome!!!". Parnitha-np.gr. Retrieved 10 June 2009. ^ "Acropolis: Threat of Destruction". Time Magazine. Time.com. 31 January 1977. Retrieved 3 April 2007. ^ a b c d Kitsantonis, Niki (16 July 2007). "As forest fires burn, suffocated Athens is outraged". International Herald Tribune. Archived from the original on 18 September 2007. Retrieved 3 February 2008. ^ a b "Rot sets in as Athens's trash problem mounts". 30 January 2007. Archived from the original on 14 January 2009. Retrieved 10 February 2008. ^ "Interesting European Weather Facts and Extremes". web2.airmail.net. Retrieved 12 March 2019. ^ "European Cities With Driest Weather - Current Results". www.currentresults.com. Retrieved 12 March 2019. ^ Franks, Ian (21 November 2015). "Warmest and driest winters in Europe". 50shadesofsun. Retrieved 12 March 2019. ^ a b Το αρχείο του Θησείου (in Greek). Meteoclub. Retrieved 26 March 2019. ^ hpanitsidis (22 June 2007). "ΕΡΓΟ ΑΝΑΒΑΘΜΙΣΗΣ ΔΙΥΛΙΣΤΗΡΙΟΥ ΕΛΕΥΣΙΝΑΣ" (PDF). Retrieved 3 October 2014. ^ Giannakopoulos C., Hatzai M., Kostopoulou E., McCarty M., Goodess C. (2010). "The impact of climate change and urban heat islands on the occurrence of extreme events in cities. The Athens case". Proc. of the 10th International Conference on Meteorology, Climatology and Atmospheric Physics, Patras, Greece, 25–28 May 2010, pp. 745–752. ^ a b "European Space Agency ESA helps make summer in the city more bearable". Archived from the original on 22 November 2010. Retrieved 7 November 2010. ^ Kassomenos P.A. and Katsoulis B.D. (2006). "Mesoscale and macroscale aspects of the morning Urban Heat Island around Athens, Greese", Meteorology and Atmospheric Physics, 94, pp. 209–218. ^ Santamouris M. (1997). "Passive Cooling and Urban Layout". Interim Report, POLIS Research Project, European Commission, Directorate General for Science, Research and Development and human wellbeing and health. ^ Katsoulis, B. (1987). "Indications of change of climate from the Analysis of air temperature time series in Athens, Greece". Climatic Change. 10 (1): 67–79. Bibcode:1987ClCh...10...67K. doi:10.1007/BF00140557. ^ Repapis, C. C.; Metaxas, D. A. (1985). "The Possible influence of the urbanization in Athens city on the air temperature climatic fluctuations at the National Observatory". Proc. of the 3rd Hellenic-British Climatological Congress, Athens, Greece 17–21 April 1985: 188–195. ^ Philandras, C. M.; Metaxas, D. A.; Nastos, P. T. (1999). "Climate variability and Urbanization in Athens". Theoretical and Applied Climatology. 63 (1–2): 65–72. Bibcode:1999ThApC..63...65P. doi:10.1007/s007040050092. ^ Philandras, C. M.; Nastos, P. T. (2002). "The Athens urban effect on the air temperature time series of the National Observatory of Athens and New Philadelphia stations". Proc. of the 6th Hellenic Conference on Meteorology, Climatology and Atmospheric Physics, Ioannina Greece, 25–28 September 2002: 501–506. ^ Repapis, C. C.; Philandras, C. M.; Kalabokas, P. D.; Zerefos, C. S. (2007). "Is the last years abrupt warming in the National Observatory of Athens records a Climate Change Manifestation?". Global NEST Journal. 9 (2): 107–116. ^ Livada, I.; Santamouris, M.; Niachou, K.; Papanikolaou, N.; Mihalakakou, G. (2002). "Determination of places in the great Athens area where the heat island effect is observed". Theoretical and Applied Climatology. 71 (3–4): 219–230. Bibcode:2002ThApC..71..219L. doi:10.1007/s007040200006. ^ "World Meteorological Organization's World Weather & Climate Extremes Archive". Arizona State University website. World Meteorological Organization. ^ Афины,Греция #16716 (in Russian). Climatebase. Retrieved 14 March 2014. ^ "Weather Information for Athens". ^ "Cushman & Wakefield – Global real estate solutions – News & Events". Cushwake.com. 25 October 2006. Archived from the original on 27 September 2007. Retrieved 21 March 2009. ^ a b c "Olympic Games 2004: five major projects for Athens". European Union Regional Policy. ec.europa.eu. Archived from the original on 20 May 2007. Retrieved 5 April 2007. ^ "Eaxa :: Ενοποιηση Αρχαιολογικων Χωρων Αθηνασ Α.Ε". Astynet.gr. Archived from the original on 28 February 2009. Retrieved 21 March 2009. ^ "Distance between Piraeus (Attiki) and Varkiza (Piraios Nomos) (Greece)". Distancecalculator.globefeed.com. 9 December 2007. Retrieved 9 June 2009. ^ "Hellenikon Metropolitan Park Competition". Hellenic Ministry of the Environment and Public Works. www.minenv.gr. Archived from the original on 8 April 2004. Retrieved 3 January 2007. ^ "Europe | Greek forest fire close to Athens". BBC News. 29 June 2007. Retrieved 9 June 2009. ^ "Distance between Athens, Greece and Piraeus, Greece". distances-from.com. 9 December 2007. Retrieved 8 February 2018. ^ "PAGE-themes". statistics.gr. Archived from the original on 6 October 2014. Retrieved 3 October 2014. ^ Thomas, C.G. ; Conant, C. (2009). Citadel to City-State: The Transformation of Greece, 1200-700 B.C.E. Indiana University Press. p. 65. ISBN 978-0-253-00325-6. ^ Ian Morris (12 December 2005). "The growth of Greek cities in the first millennium BC" (PDF). Retrieved 3 October 2014. ^ Storey, G. (2006). Urbanism in the Preindustrial World: Cross-Cultural Approaches. University of Alabama Press. p. 37. ISBN 978-0-8173-5246-2. ^ Beer, J. (2004). Sophocles and the Tragedy of Athenian Democracy. Praeger. p. 4. ISBN 978-0-313-28946-0. ^ Schwartz, G.M. ; Nichols, J.J. (2010). After Collapse: The Regeneration of Complex Societies. University of Arizona Press. p. 80. ISBN 978-0-8165-2936-0. ^ a b "Urban History of Athens" (PDF). 9 December 2008. Retrieved 3 October 2014. ^ Kellogg, D.L. (2013). Marathon Fighters and Men of Maple: Ancient Acharnai. OUP Oxford. p. 36. ISBN 978-0-19-166386-4. ^ Hansen, M.H. (1988). Three Studies in Athenian Demography. Commissioner, Munksgaard. p. 7. ISBN 9788773041895. ^ Wilson, N. (2013). Encyclopedia of Ancient Greece. Taylor & Francis. p. 214. ISBN 978-1-136-78800-0. ^ O'Sullivan, L. (2009). The Regime of Demetrius of Phalerum in Athens, 317–307 BCE: A Philosopher in Politics. Brill. p. 110. ISBN 9789004178885. ^ a b c d e Tung, Anthony (2001). "The City of the Gods Besieged". Preserving the World's Great Cities:The Destruction and Renewal of the Historic Metropolis. New York: Three Rivers Press. pp. 260, 263, 265. ISBN 0-609-80815-X. ^ "World Gazetter City Pop:Athens". www.world-gazetter.com. Archived from the original on 22 June 2011. Retrieved 16 June 2011. ^ "World Gazetter Metro Pop:Athens". www.world-gazetter.com. Archived from the original on 22 June 2011. Retrieved 16 June 2011. ^ a b c "Population of Greece". General Secretariat of National Statistical Service of Greece. www.statistics.gr. 2001. Archived from the original on 1 July 2007. Retrieved 2 August 2007. ^ "ΑΡΧΕΙΟ ΝΕΟΤΕΡΩΝ ΜΝΗΜΕΙΩΝ - Δημαρχείο Αθηνών". www.eie.gr. Retrieved 26 February 2019. ^ a b c d e f "Twinnings" (PDF). Athens: Central Union of Municipalities & Communities of Greece. Retrieved 16 June 2015. ^ "Beijing Sister Cities". City of Beijing. www.ebeijing.gov.cn. Retrieved 3 January 2007. ^ "Los Angeles Sister Cities". City of Los Angeles. www.lacity.org. Archived from the original on 4 January 2007. Retrieved 3 January 2007. ^ "Nicosia:Twin Cities". Nicosia Municipality. www.nicosia.org.cy. Archived from the original on 24 May 2011. Retrieved 25 January 2008. ^ "International Cooperation". Grad Beograd. www.beograd.rs. Retrieved 26 January 2008. ^ "International: Special partners". Mairie de Paris. www.paris.fr. Archived from the original on 8 February 2007. Retrieved 26 January 2008. ^ Vacca, Maria Luisa. "Comune di Napoli -Gemellaggi" [Naples – Twin Towns]. Comune di Napoli (in Italian). Archived from the original on 22 July 2013. Retrieved 8 August 2013. ^ "Partnership cities". Yerevan municipality. www.yerevan.am. Retrieved 17 April 2018. ^ "Where is Atenas De San Cristobal in Atlantida, Honduras Located?". ^ Parilla, Alan Berube, Jesus Leal Trujillo, Tao Ran, and Joseph (22 January 2015). "Global Metro Monitor". Brookings. Retrieved 23 February 2019. ^ "CARGO CONTAINER CENTERS". GAIA OSE. 8 October 2017. Retrieved 24 February 2019. ^ "Report for Selected Countries and Subjects". www.imf.org. Retrieved 24 February 2019. ^ "Εξαπλασιάστηκαν σε μία πενταετία οι τουρίστες στην πρωτεύουσα, Του Ηλία Μπέλλου | Kathimerini". www.kathimerini.gr. Retrieved 24 February 2019. ^ "Καμίνης: Το 2018 η Αθήνα θα σπάσει κάθε ρεκόρ στον τουρισμό". www.sofokleousin.gr (in Greek). Retrieved 24 February 2019. ^ "Προαστιακός". Proastiakos.gr. Archived from the original on 24 March 2009. Retrieved 21 March 2009. ^ "Tram Sa". Tramsa.gr. Archived from the original on 14 January 2009. Retrieved 5 January 2009. ^ "Athens Urban Transport Network in Facts and Figures (pdf) page 5" (PDF). OASA. www.oasa.gr. Archived from the original (PDF) on 29 June 2006. Retrieved 28 January 2007. ^ a b "Athens Urban Transport Network in Facts and Figures (pdf) page 6" (PDF). OASA. www.oasa.gr. Archived from the original (PDF) on 29 June 2006. Retrieved 28 January 2007. ^ Ilias Tatsiopoulos & Georgios Tziralis. "New, Post-Olympics Athens" (PDF). www.minpress.gr. Secretariat General of Communication – Secretariat General of Information. p. 79. Archived from the original (PDF) on 9 September 2008. Retrieved 23 August 2008. ^ "Athens Urban Transport Network in Facts and Figures (pdf) page 11" (PDF). OASA. www.oasa.gr. Archived from the original (PDF) on 29 June 2006. Retrieved 28 January 2007. ^ "Athens Metro". Hellenic Ministry of Culture. www.culture.gr. Archived from the original on 7 December 2006. Retrieved 26 January 2007. ^ a b c d "Athens Urban Transport Network in Facts and Figures (pdf) page 15" (PDF). OASA. www.oasa.gr. Archived from the original (PDF) on 29 June 2006. Retrieved 4 February 2007. ^ "Homepage - The Company - Attiko Metro S.A." Attiko Metro S.A. Archived from the original on 3 December 2010. Retrieved 2014-06-02. ^ a b c d "Proastiakos". www.proastiakos.gr. Archived from the original on 3 February 2009. Retrieved 9 June 2009. ^ a b c d e "Tram Sa". Tramsa.gr. Archived from the original on 21 July 2011. Retrieved 25 October 2009. ^ "Athens Urban Transport Network in Facts and Figures (pdf) page 13" (PDF). OASA. www.oasa.gr. Archived from the original (PDF) on 29 June 2006. Retrieved 28 January 2007. ^ "Tram Sa". Tramsa.gr. Archived from the original on 21 July 2011. Retrieved 25 October 2009. ^ a b c d "Athens International Airport: Facts and Figures". Athens International Airport. www.aia.gr. Retrieved 11 February 2007. ^ a b c "Athens International Airport: Airport Profile". Athens International Airport. www.aia.gr. Retrieved 11 February 2007. ^ "ATHENS INTERNATIONAL AIRPORT "EL.VENIZELOS"". aia.gr. Retrieved 7 May 2015. ^ a b "Athens International Airport: Passenger Traffic Development 2007" (PDF). Athens International Airport. Archived from the original (PDF) on 10 October 2008. Retrieved 6 February 2008. ^ "Athens International Airport: Air Traffic Movements Development 2007" (PDF). Athens International Airport. Archived from the original (PDF) on 5 February 2009. Retrieved 6 February 2008. ^ "1973: Army deposes 'hated' Greek president". BBC News. 25 November 1973. Retrieved 22 March 2009. ^ "ΙδιωτικάΠανεπιστήμιαστην Ελλάδα – PrivateUniversities in Greece". ^ "AIA: Finance" (PDF). Athens International Airport, S.A. www.AIA.gr. Archived from the original (PDF) on 5 February 2009. Retrieved 5 April 2007. ^ "Home Page". Urban Audit. Archived from the original on 6 February 2009. Retrieved 21 March 2009. ^ "Athens – Epidaurus Festival 2008". Greekfestival.gr. Archived from the original on 22 February 2009. Retrieved 21 March 2009. ^ "Megaron Events Chart". Megaron.gr. 26 October 1997. Archived from the original on 1 February 2009. Retrieved 21 March 2009. ^ Ίδρυμα Ευγενίδου. Εκπαιδευτικό Κοινωφελές Ίδρυμα (in Greek). Eugenfound.edu.gr. Archived from the original on 8 June 2008. Retrieved 21 March 2009. ^ ΙΔΡΥΜΑ ΕΥΓΕΝΙΔΟΥ 1954 / Ιστορικό (in Greek). Eugenfound.edu.gr. Retrieved 25 October 2009. ^ "Athens Eugenides Planetarium". Barco. Archived from the original on 7 July 2011. Retrieved 16 June 2011. ^ "Vision". SNFCC. Retrieved 16 November 2016. ^ a b c Athens – The Truth: Searching for Mános, Just Before the Bubble Burst. Tales of Orpheus. 1 September 2013. ISBN 9780955209031. Retrieved 24 October 2013. ^ "Athens 21st Century – Athens Olympic Stadium". Athens-today.com. Retrieved 26 December 2008. ^ "Athens 21st Century – The Olympic Coastal Complex". Athens-today.com. Retrieved 26 December 2008. ^ "Ιστορικό". oaa.gr. Archived from the original on 20 April 2015. Retrieved 13 April 2015. ^ a b c "Athens bids farewell to the Games". CNN. CNN.com. 30 August 2004. Retrieved 29 March 2007. ^ Athens News Agency (27 August 2004). "Olympic ticket sales officially top 3.5-million mark". Embassy of Greece. Archived from the original on 27 September 2007. Retrieved 30 March 2007. ^ Rogers, Martin. "Beijing trumps Athens... and then some". Sports.yahoo.com. Archived from the original on 28 September 2009. Retrieved 21 March 2009. ^ Itano, Nicole (21 July 2008). "As Olympic Glow Fades, Athens Questions $15 Billion Cost". Csmonitor.com. Archived from the original on 9 March 2009. Retrieved 21 March 2009. ^ "After The Party: What happens when the Olympics leave town". London: Independent.co.uk. 19 August 2008. Archived from the original on 6 September 2008. Retrieved 21 March 2009. ^ "Four years after Athens Greeks have Olympics blues". Afp.google.com. 30 July 2008. Archived from the original on 6 August 2008. Retrieved 21 March 2009. Kerameikos also known by its Latinized form Ceramicus, is an area of Athens, Greece, located to the northwest of the Acropolis, which includes an extensive area both within and outside the ancient city walls, on both sides of the Dipylon (Δίπυλον) Gate and by the banks of the Eridanos River. It was the potters' quarter of the city, from which the English word "ceramic" is derived, and was also the site of an important cemetery and numerous funerary sculptures erected along the road out of the city towards Eleusis. 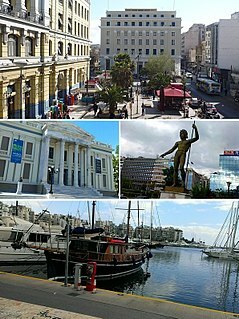 Piraeus is a port city in the region of Attica, Greece. Piraeus is located within the Athens urban area, 12 kilometres southwest from its city centre, and lies along the east coast of the Saronic Gulf. Tourism in Greece has been a key element of the economic activity in the country, and is one of the country's most important sectors. Greece has been a major tourist destination and attraction in Europe since antiquity, for its rich culture and history, which is reflected in large part by its 18 UNESCO World Heritage Sites, among the most in Europe and the world as well as for its long coastline, many islands, and beaches. Attica, or the Attic peninsula, is a historical region that encompasses the city of Athens, the capital of Greece. It is a peninsula projecting into the Aegean Sea, bordering on Boeotia to the north and Megaris to the west. The Athens Metro is a rapid-transit system in Greece which serves the Athens conurbation and parts of East Attica. It incorporates the former Athens-Piraeus Electric Railways (ISAP), which opened as a conventional steam railway in 1869, was electrified in 1904, and is now part of Line 1. Beginning in 1991, Attiko Metro constructed and extended Lines 2 and 3 and the Attiko Metro Operations Company (AMEL) operated these lines from 2000 to 2011. The metro network merged in 2011 when the Greek government created the Urban Rail Transport Company (STASY), a subsidiary of the Athens Urban Transport Organisation (OASA). First Chairman and CEO of the merged company became Kostas Vassiliadis, a former Chief Engineer and later CEO of Athens-Piraeus Electric Railways. The system is noted for being modern and efficient, in its own right and in comparison to other subway systems elsewhere. It has significantly changed Athens by providing a much-needed solution to the city's traffic and air pollution problem, as well as revitalising many of the areas it serves. An extension of Line 3 is under construction towards Piraeus and also other extensions of existing lines, as well as a new line, are under consideration. The Athens Metro is actively connected with the other means of public transport, such as buses, trolleys, the Athens Tram and the Proastiakos suburban railway. The Athens Metro is hailed for its modernity and many of its stations feature works of art, exhibitions and displays of the archeological remains found during its construction. Photography and video-taking is permitted across the whole network and street photographers often work in Athens Metro. Athens is one of the oldest named cities in the world, having been continuously inhabited for at least 5000 years. Situated in southern Europe, Athens became the leading city of Ancient Greece in the first millennium BC, and its cultural achievements during the 5th century BC laid the foundations of western civilization. 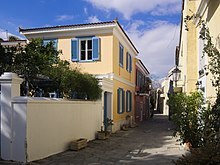 Acharnes is a suburb of Athens, Attica, Greece. With 106,943 inhabitants, it is the most populous municipality in East Attica. It is part of the Athens Urban area. The Proastiakos is the collective name for Greece's suburban railway services, which are run by TrainOSE, the country's only rail operator, on infrastructure owned by the Hellenic Railways Organisation (OSE). The Athens Mass Transit System is the largest mass transit system of Greece. The system is run by the OASA S.A. organisation and serves all areas in Athens Urban and Metropolitan Area. Tavros, is a suburb in the southwestern part of the Athens agglomeration, Greece. Since the 2011 local government reform it is part of the municipality Moschato-Tavros, of which it is a municipal unit. Ilioupoli is a suburban municipality in the southeastern part of the Athens urban area, Greece. Its name is the modern form of the ancient name of Heliopolis in Egypt. Development of Ilioupoli started around 1924, when Greek refugees from Asia Minor settled there. Ilioupoli is twinned with Novi Sad (Serbia) and Larnaca (Cyprus). Palaio Faliro is a coastal district and a municipality in the southern part of the Athens agglomeration, Greece. At the 2011 census it had 64,021 inhabitants. Markopoulo Mesogaias is a suburban town and a municipality in East Attica, Greece. The municipality has an area of 81.844 km2. Although long walls were built at several locations in ancient Greece, notably Corinth and Megara, the term Long Walls generally refers to the walls that connected Athens to its ports at Piraeus and Phalerum. Built in several phases, they provided a secure connection to the sea even during times of siege. The walls were about 6 km in length, initially constructed in the mid 5th century BC, destroyed by the Spartans in 403 BC after Athens' defeat in the Peloponnesian War, and rebuilt again with Persian support during the Corinthian War in 395-391 BC. The Long Walls were a key element of Athenian military strategy, since they provided the city with a constant link to the sea and thwarted sieges conducted by land alone. The Port of Piraeus is the largest Greek seaport and one of the biggest in the Mediterranean Sea and Europe. 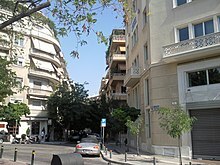 Ermou Street, is a one and a half kilometer-long road in central Athens, Greece, connecting Kerameikos archaeological site with the Syntagma Square through Monastiraki, Psiri and Thiseio.